Kenilworth Village Hall is located at 419 Richmond Road, Kenilworth, IL 60043; phone: 847-251-1666. Photo: Hiram Baldwin House (Baldwin-Wackerie Residence), ca. 1905, 205 Essex Road, Kenilworth, IL. Prairie style home designed by Frank Lloyd Wright. The Historic District was listed on the National Register of Historic Places in 1983. Photographed by User:Magicpiano (own work), 2015, [cc-by-4.0 (creativecommons.org/licenses/by-sa/4.0/deed.en)], via Wikimedia Commons, accessed January, 2016. The Village of Kenilworth, Illinois was the newest of the North Shore communities and has always been the smallest. It was established in 1889 by Joseph Sears, who purchased the 224 undeveloped acres, envisioning a homogeneous, family-focused community with large lots, and high standards of construction—no alleys. The tract of land was sited between the Milwaukee Branch of the North-Western railway on the west and the Lake on the east and by the Mahoney farm to the south and Winnetka Avenue on the north. The Kenilworth name is taken from a town in the Midlands section of England, and its street names are similarly of English origin. Kenilworth's earliest architecture of the early 1890s and early Twentieth Century was designed by prominent architects who used a variety of Revival styles for the residences. 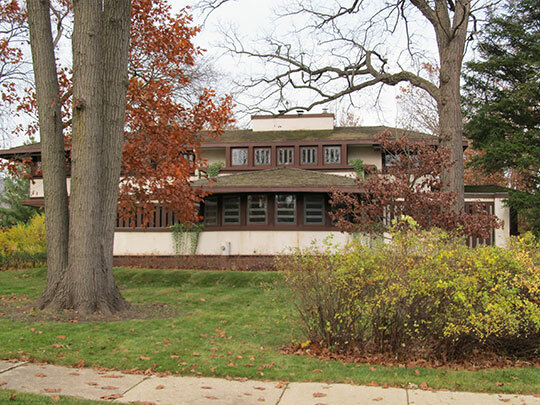 George Maher, a contemporary of Frank Lloyd Wright and a Kenilworth resident, designed 40 Prairie style homes in the Village. In the early 1920s, Kenilworth annexed two areas west of Green Bay Road and created the Community Development, and the Brier Street neighborhood situated north of Kenilworth Avenue. Many of the houses built in these newer areas favored variations of modem styles based on historical precedent. And because this section of Kenilworth, commonly referred to as "West Kenilworth," did not have the same deed restrictions as the original Kenilworth tract, the lots and houses tended to be smaller than those properties located east of Green Bay Road. Kenilworth is one of the most exclusive enclaves in the Midwest. The average resident's median income is estimated at nearly one million dollars, and the median home value is one and one half million dollars. Kenilworth has been listed as one of the most affluent communities in America by Forbes magazine in 2005 and 2006. And in 2007, Forbes listed Kenilworth as the 19th most expensive zip code in the United States. Christine Bernick, Historic Preservation Student, School of the Art Institute, Dr. Robert Hohf House, Cook County, IL, nomination document, 2008, National Park Service, National Register of Historic Places, Washington, D.C.